On a Monday morning most of the working population can fairly accurately predict what the rest of the week will bring. With the week more or less mapped out in advance, you can get on and apply yourself to the tasks at hand without wondering what will happen next. Week after week, the income you earn goes to pay for your home, your bills, your car, your children’s education and care. Your income also pays for your holidays and all the other things that go to make up the life you are living right now. It’s the least you deserve – to enjoy the things you work so hard to pay for. So what would happen if, almost without warning, that money was no longer there? What would happen if you were to suffer a debilitating accident or become so seriously ill that you were unable to work for six months or more? What would happen to the income upon which so much of your lifestyle depends? Of course, it’s impossible for any of us to know exactly what the future might bring. But the risk of serious injury or illness leaving you unable to earn an income is not so remote that you should not consider it. A car or motorcycle accident, a sports injury, the onset of severe depression, a stroke or heart disease – but we have all heard of, and possibly know, people who have suffered conditions just like these. Quite apart from the health considerations, have you considered the financial implications? If you work for a company then you will probably qualify for some form of sick pay from your employer. This will cover some if not all of your financial commitments over the first few weeks or months of your absence. But it’s very rare indeed for an employer’s sick pay scheme to cover you beyond six months. Once your sick pay cover runs out you will become dependent on the State for support. The State Illness benefit from March 2017 is only €193 per week (for a single person) (This is set to increase by €5 in March 2018). Even if you calculate your most basic monthly financial commitments – mortgage/rent, pension, heating, lighting, groceries, clothing, transport and education – you will see that the State Illness Benefit is hardly enough to support even the most basic lifestyles. Given the financial risks associated with serious illness or disability, it’s hardly surprising that there’s an insurance product which is specifically designed to protect you from the worst financial consequences. This is called Income Protection and it is a very straightforward product which pays you an income if the unexpected does happen and you are unable to earn an income. With Income Protection you simply pay a monthly premium (which qualifies for tax relief at your marginal rate) based on the amount of your income which you want to cover, the level of benefits you require and the state of your health. 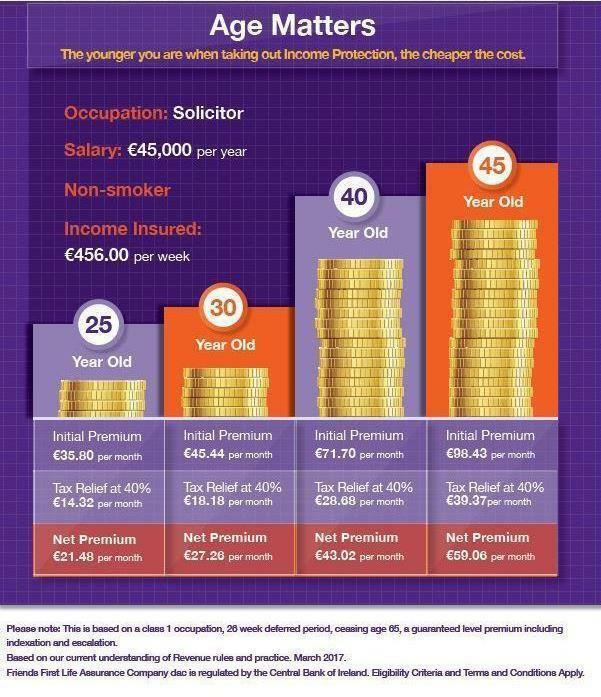 Then, if you suffer any illness, injury or disability which prevents you from working and earning an income, your Income Protection policy will pay you a replacement income of up to 75% of your salary until such time as you are fit to return to work or until you retire. It is important to note that unlike Critical or Specified Illness Cover, which covers you for a limited set of specified illnesses, Income Protection covers you for any illness or injury, including mental illness, cancer, slipped disks and multiple sclerosis. 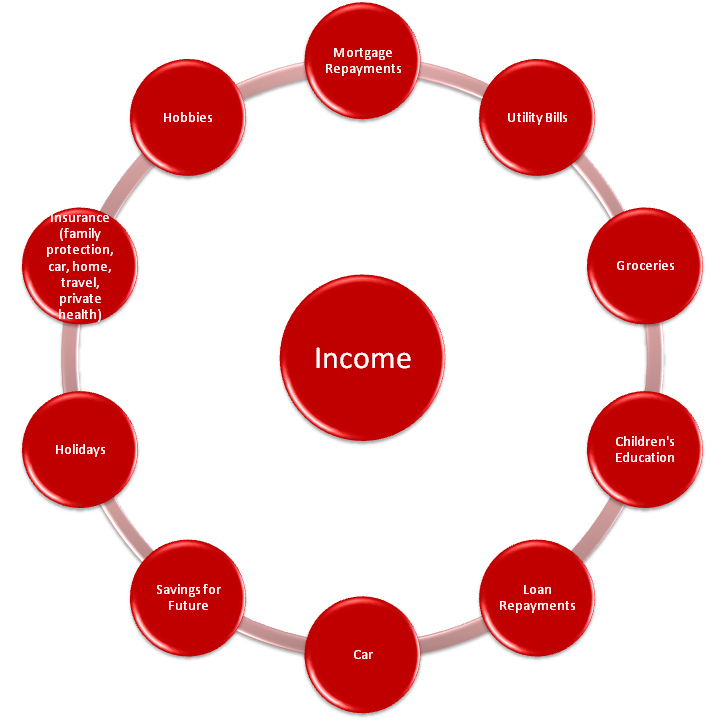 Income Protection can be designed to fit your specific needs. You can usually choose a deferred or waiting period of between 1 month and a year, and you also have the option of index-linking your payments and benefits so that your policy keeps pace with your lifestyle. If you are not working, very often you will find that your financial needs are lower so, depending on your commitments, you can choose to protect up to 75% of your salary. Alongside a replacement income, Income Protection also offers a variety of additional benefits, such as workplace rehabilitation and career counselling. These specialist services can be invaluable as you prepare to recover your life and return to the workforce. Income Protection is a flexible product designed to reflect the demands of today’s lifestyles, which means that there are many ways of adapting it to suit your circumstances. Your financial advisor can show you how to choose and customise an Income Protection policy that delivers complete peace of mind when you are healthy and also delivers the financial and rehabilitation support you’ll need if the unexpected does happen and you suffer a serious illness or injury that leaves you unable to work. If you’re looking to take out an income protection policy, we can assess the market and provide you with a competitive quote, please contact us on 01 4972544.